Welcome trusty reader to the Chronicles of Nausea……or……NEVER travel by train with a hangover :o) for this is how it all started this time. My brother got the transfer he wanted and so will be moving back to Wales [the inconsiderate s*d] and in one fell swoop has increased threefold the cost of my future trips, but I digress…. As I was staying in central London this time I decided to let the train take the strain….BIG mistake! 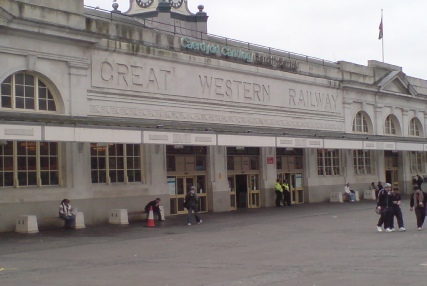 Well it started well enough, the first thing when I got to Cardiff Central train station was a helpful man directing me to the nearest convenience and letting me into the secret of which one hadn’t been vandalised recently, very helpful so I can only guess he hadn’t been in the job long….sorry that’s being bitchy but bearing in mind my other meetings with BR staff this man was definitely in the minority. My trip was in an inside seat with a table which as well as not being needed significantly added to my feeling of claustrophobia. 2 hours of the Father & son sitting next to me playing hangman, when you have a hangover is enough to lose you the will to live. By the way if playing with your parents when you were about 8 would you have used “The Old Farts” as a clue??? And, 2 – and most importantly … I could still walk! Well I hadn’t been able to straighten my legs let alone stand for the entire trip so this was a happy revelation. As you may have gathered I will be returning to the Car for my next trip. A Taxi from the station to my Hotel, and “your room isn’t ready”. This wasn’t a surprise as I was told check in was after 2pm and this was about 11:40 ish, so I checked in my cases and headed for the nearest ticket booth as “I had a Dream” [song title in there somewhere :o)] I wanted to see Miss Saigon……..TWICE….. in a day……. I was “lucky” I got a ticket for the matinee, the evening was already covered, so I handed over my £40.00, well it is the last day I thought, and was told to call back in an hour or so….so this is where I decided to try and be sneaky, I went back to the Hotel and asked a different check in clerk if I could check in……….and she said yes, and asked me for my £159.00 a small shock as I was told originally £152.00, not a great difference but for one on a budget not a pleasant surprise. A tip here, get all your plans in writing in advance that way at least you have something to argue with. Quick check in, then back to the booth to find the owner not happy with his assistant a feeling I soon joined him in when they couldn’t find my ticket, minor heart attack not withstanding I made my way to the Theatre ticket in hand. Got to Covent Garden ………….realised I had forgotten my glasses so walked all the way back. Well I decided it was too much like hard work to walk back again as London seemed even busier than usual that Saturday so I took the tube, upon arriving at Covent Garden there was a massive queue for the lifts then someone headed for the stairs. So I thought “simple physics short lift ride = Not many stairs” [ by the way I flunked Physics and It nearly bloody killed me! ] There were people left on those stairs at various levels like the approach to Everest, and we were trying the hard way…… Without Oxygen! I made it to the top sweating, heart pounding and legs like jelly. Staggered to the Theatre to be told I’d entered through the wrong door, so they sent me round the side of the Theatre and …………….up 6 flights of stairs! It was at this point I started to suspect something that was confirmed when I saw my seat, I wouldn’t say I was high up but I was literally looking DOWN onto the chandeliers! The ticket had a face value of approximately £12.00. Even this couldn’t dampen a magical day for me. This is my show as you may have gathered by the fact I’ve seen it over 12 times. I won’t bore you with a review again just a few points that stood out for me, all the performances were excellent with Cezarah Campos and Niklas Andersson playing “Kim” & “Chris” at the matinee and Joanna Ampil & David Shannon in the evening. At the Matinee I particularly remember the final bows, because as soon as Cezarah came out she burst into tears taking most of the audience with her! Mind you the young lady sitting next to me had gone as soon as “Kim” started talking to “Tam” during “Little God of my heart”. I must admit to going at the points that always get me, the scene where “Kim” shoots “Thuy” and obviously where “Kim” dies. In-between the shows I spent a pleasant few hours in the Nell of old Drury a pub opposite the Theatre, it’s great, the atmosphere is excellent, it’s only the size of my living room, but great all the same :o). We were entertained by a Violin and Flute “jam” session and then it was back to Miss Saigon. The evening performance was as faultless as one has come to expect from this show and at the End the audience didn’t want to let the cast go calling them back again and again for so many curtain calls I lost count. At the end the cast were joined by Matthew Ryan Associate Director and Maggie Goodwin Associate Choreographer. A wonderful ending to a show that should not have gone. I have been reliably informed that the show really has now gone the next morning they stripped out the set, cleared the dressing rooms and took down the signs. All I can say is I was in London for another 2 days and I couldn’t bring myself to go near the place. It has a lot of memories for me both show related and personal so it really was the end of an era. ………….. good bye Miss Saigon………. see ya soon. Now then what can I say about the other movie, well, if I had a lap-top and could have written this review while in London it would have consisted of one word Cr*p. But with hindsight I’ll say it was not my type of movie, the movie by the way was “The Blair Witch Project”. Well it was Halloween so I fell for the hype. Call it simplistic but I like to understand that I don’t understand the content of a movie, NOT be left sitting there at the end thinking “Is that it?…it can’t be……surely”………but it was. To temper my comments and give you a comparison “American Pie” is my type of comedy not “ART” and the other film I saw whilst in London “John Carpenters VAMPIRES” is my type of Horror film. [even if it was written by a Mr. Stake!]. And at this point I must apologise to the young lady sitting in front of me in the cinema for “Vampires” and all I can say is I hope your heart beat has returned to normal. I think I should explain, well in this movie the main “baddy”, a Vampire suprise suprise, is tall, pale with long dark hair and wears a very natty long black coat…….now the problem arises [and I think regular reader may be ahead of me here] I’m 6’3″, never what you may call rosy cheeked, I have a ponytail and do like my long dark coat. So I’m sorry that I shot up so quickly as you left at the end of the movie it wasn’t deliberate honest. As I walked back to the Hotel I came to realise something London can be a Very lonely place, I’m not playing for sympathy here it’s just a fact I noticed, if there’s two or more of you then it’s the best place in the world for me bar none, but if on your own there doesn’t seem to be a lonelier place on the planet. I talk to most people and like to have fun but was left feeling an outsider this trip. whether it was because I was staying at a Hotel this time without the friends I’d made on previous trips, I don’t know it could even have been because Miss Saigon had closed, as one feeling I hate is “change” it’s always been the same since I was a kid, but that’s what I felt. To kick this feeling I tried a pub called “Callaghans” it’s part of the Regent Palace Hotel and has live music every night, the atmosphere was lively, the music on this night very good, and I was shot by a walking computer game character! …………..well it was Halloween and this particular lady dressed as the character from Tomb Raider and when her water pistol was turned on her I was caught in the crossfire. Good place though. The Hotel I’ve mentioned earlier and here I must tell you a few things, firstly I, given any choice won’t be going there again, the price was one hitch this time, the other was the workmen starting at 8am every morning renovating some of the rooms, the final straw was the Geordy “gentleman” who was remonstrating with his companions to be allowed into his room at about 4am yesterday morning, I think some form of security wouldn’t have gone amiss. 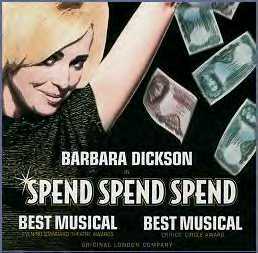 The end of my trip was another show and this time I decided on “Spend Spend Spend” at the Piccadilly Theatre starring Barbara Dickson, Steven Houghton [check your e-mail Nikki] and a newcomer called Rachel Leskovac. The set was great with the smoking chimneys of Vivs’ hometown, to the use of conveyor belts, which I took to show the fleeting nature of both Viv’s money and more hurtfully her happiness. I noticed it for the queue of young girls who were there when I ventured out at 10am and STILL there after the cinema……..lunch……….a drink…..shopping…….at 4pm. Waiting for WESTLIFE I admire your stamina as the weather was how can I put it………….typical London in November! Well that’s about it, hope you enjoyed my ramblings again. Ooh a little footnote my trip was made by a nice man…… a very very nice man……get your mind out of the gutter! He runs Albermarle ticket agency and was kind enough to give me their copy of the “You’ll Miss Saigon” poster and this MADE my trip! Thanks very much.